One of my unofficial blog goals this year is to offer up a different workout every Wednesday. So far this year, we've done a Prenatal Workout, Reps for Time, and an Upper Body Workout with Cable Machine. 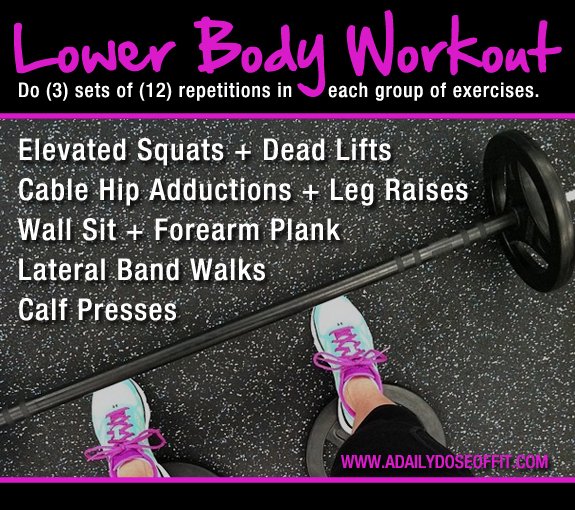 It seems only logical that this week's workout revolves around your lower body...and, you know, I promised you that it would. Remember, you need to warm up first and stretch when you're done. Even though I'm a certified personal trainer, I need you to proceed with caution. I don't know what your specific needs and limitations are, and only you can prevent injury in regards to what follows. What kind of equipment will you need? A cable machine, free weights and a weighted bar. We'll talk modifications toward the end. 1) Elevate your heels using weight plates as shown in the image. Use a loaded bar, but you can substitute free weights if that's all you have. Use the free weights for your dead lifts, too. Or stick with the bar. Whatever works! 2) Stand with the outside of your hip facing the lowered anchor point. Pull your attached foot toward the base leg, crossing in front of the base ankle just a bit to burn the muscles in your inner thigh. When Without switching ankles, adjust your position so that you're kneeling on a bench with your base leg (you should be facing the anchor at this point. Your working leg should be perpendicular to the floor...until you lift it up behind you, which actively works the gluteus group. If you don't have access to a cable machine, you might find success with ankle weights or bands. 3) When performing lateral band walks, you want the band itself to sit comfortably just below your knees. Take 12 giant steps to the right, followed by 12 giant steps to the left. Repeat and enjoy the burn. Question: What's your favorite lower body exercise? Love this workout! These are definitely power house moves, and I like how you paired the exercises- thanks for sharing! You're welcome! I'm a huge fan of working in pairs like this...it keeps me moving through my workout.